The Vx 670 all-in-one wireless handheld payment device moves payments from countertops to the hands of consumers. It’s small, sleek and secure, The GPRS, technology is ideal for restaurants, bars, stadiums and delivery or transportation operations. 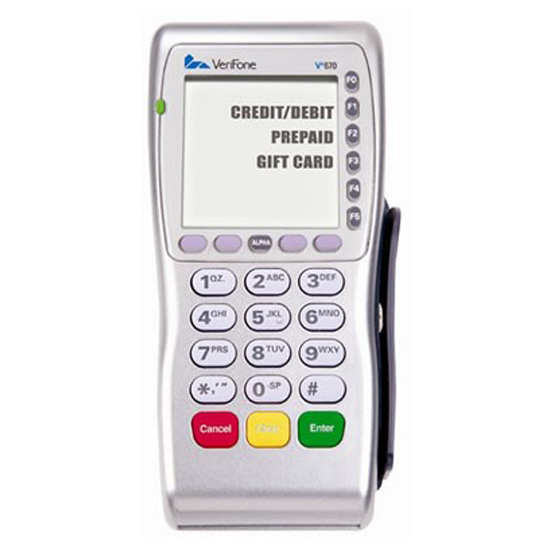 The Vx 670 offers a large user interface, white backlit display and large keys. It’s also ruggedly designed to be drop and spill resistant and withstand demanding conditions. The powerful chip processor completes transactions in seconds, making it highly valuable to waiting consumers. The Vx 670 comes with a high-capacity lithium-ion battery which can be quickly swapped with one hand and features a hidden integrated printer with a dual-tear bar that quickly produces receipts.